We landed back home to a weekend with our trusted cat-sitter Carol and my visiting mum (they're sisters, you see). Mostly we hung out at home, and I cooked up a big pot of soup. The forecast was good on Sunday, so we reacquainted ourselves with Brunswick on foot. The houses and gardens and street art were familiar and comforting, and we pointed out the odd local business that had changed in our absence. We steered Mum and Carol to East Elevation for brunch. It's deservedly popular these days and often has a waiting list, but we scored a spot at a communal table quickly. The wait for hot drinks and food was decidedly longer. Actually I'd been waiting for these crepes ($17.50) for months, maybe even a year. They've been on the menu tempting me all that time, but I've gotten distracted by the tapioca and the specials; once I went ahead and ordered them but they were sadly sold out. They were slender and slightly elastic in the best tradition of egg-based crepes, with a seam of fresh ricotta and occasional bursts of rosewater between folds. The lemon-saffron syrup and crushed hazelnut praline were subtle accents, less important than the fresh strawberry halves. 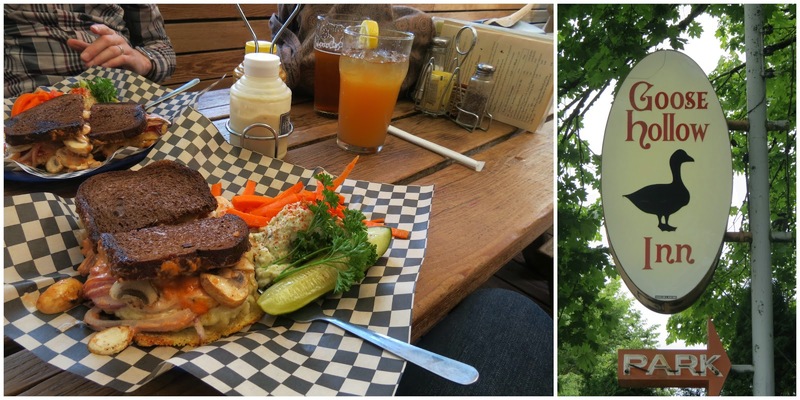 Brunch at East Elevation isn't cheap, but it certainly isn't ordinary either. We've already blogged about East Elevation one, two, three, four, five times. Since that last write-up, the brunch menu has been blogged by fellow vego Green Gourmet Giraffe, as well as omni bloggers at thehangrybitch, melbourne brunch scene and grazing panda. Accessibility: Excellent. A ramp on entry, great light, lots of space and spacious individual unisex toilets, at least one of which has disability signage. Ordering happens at the table and payment at a reasonably low counter. 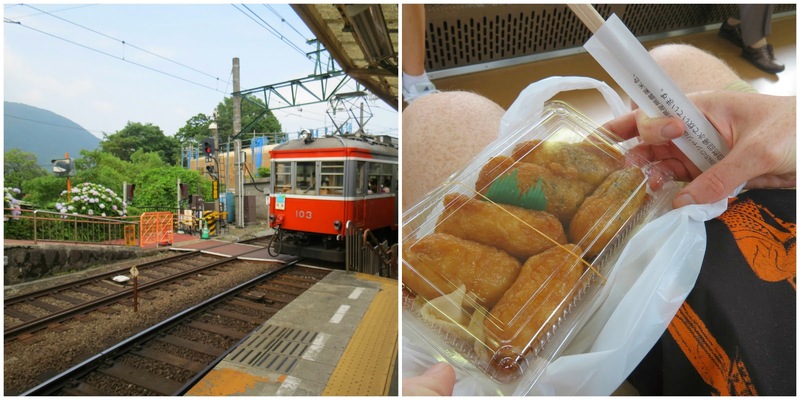 Our last day in Japan was a pretty lazy one, exploring Matt's local area, Kōenji. It's a lovely neighbourhood - a few mostly pedestrianised streets with lots of cute shops, bars and restaurants. We had a few plans for lunch, but were stymied by one place having closed down and one only opening for dinner. While we reassessed our options, we refuelled with a couple of the twee-est doughnuts in the world from Floresta doughnuts. They were excellent, with dense dough and sweet, subtle flavours - a far cry from the over-the-top richness of our Portland experience. With a sugarry charge, we decided to return to Meu Nota for a jetlag-free visit. Lunch is limited to a couple of different sets, which I found a much more fun way to explore what they have to offer. 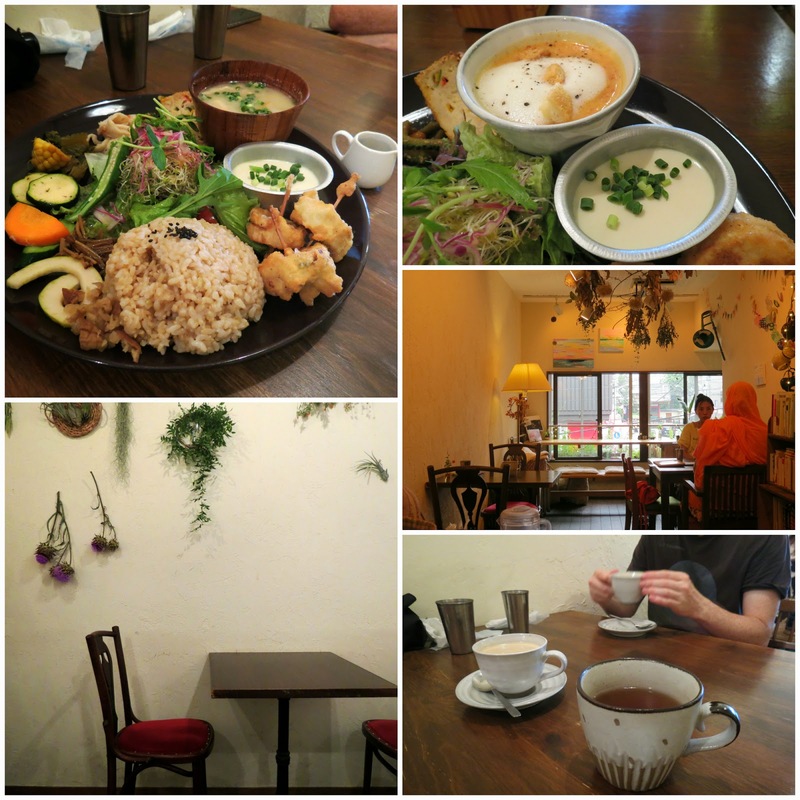 We went for the full set (1230円 ~ $12.90), with a paprika flavoured soup for Cindy and a more traditional miso for me. Alongside the soups were an amazing mix of fried goodies, pickled veggies, salad, corn bread, brown rice and a little bowl of tofu spread. Throw in your choice of coffee and tea and you've got an incredible meal - I'd definitely recommend swinging by here for lunch one day. After a little bit more wandering around, it was time to put an end to our three week adventure and jump on the train out to the airport. There was still time for one final bit of eating - we scraped together our last yen for a couple of umeboshi onigiri and some last mochi while we waited to board. 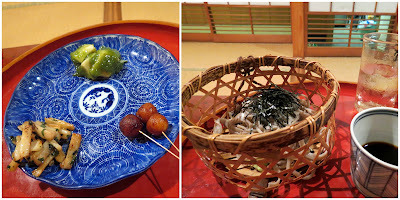 It was an incredible three week holiday (plus our respective earlier work jaunts), with so much wonderful food, ranging from fruit-loop garnished doughnuts to a banquet of delicate Japanese temple food. Hopefully you haven't minded our slightly self-indulgent holiday recapping - our regular, Melbourne-based programming will be resumed shortly! We headed to Shimokitazawa on Thursday morning, a neighbourhood known for its vintage shops and hip eateries. In typical hip style, nothing was open until 11am and many shops didn't begin trading until 1 or 2pm. 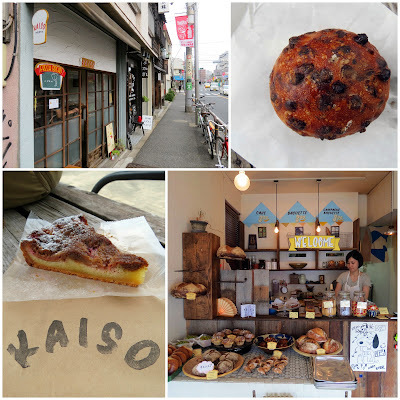 Michael wanted breakfast from Kaiso bakery (another Lee Tran Lam rec), so we wandered the blocks until the clock ticked over and we could check out their offerings. The food labels had more French than English and the savoury snacks looked suspiciously meaty, with the four cheese bialy than LTL mentioned only available later in the day. We were satisfied with the more-choc-chip-than-bread Choco (250円 ~ AU$2.60) and slice of Tarte du Mois (i.e. pie of the month, 450円 ~ AU$4.70), which worked a sturdy-to-delicate spectrum from pie crust to well-baked frangipane, fruit slices and sugared top. With a couple more hours of strolling and second-hand shopping, we had an appetite for lunch. Michael tracked down Magic Spice, a psychedelic cafe that specialises in soup curries and allusions to tripping. From their English menus we were able to deduce that the standard process is to select a soup curry base and a spice scale from The World Of Mysterious Hotness - chilli wusses start at Awakening, while the more adventurous can work through Meditation, Ecstasy, Nirvana, Paradise, Raputa ("provokes consciousness flying in the sky") to Aum Air ("awakening of a super sense of extreme hot space") for an extra couple of dollars. Then there's a range of extra toppings to select for your soup, and sweet-hot-acid condiments at the table. Michael started with a Vege-Bean soup at Nirvana, adding natto and Koya (freeze-dried) tofu (1030円 + 200円 + 120円 + 110円 ~ AU$15.30). I had my Vege-Mush at the tamer Meditation level, adding tempura sweet potato slices and aji-gotti, a "seasoning egg with soy taste" (1100円 + 100円 + 110円 + 140円 ~ AU$15.20); little did I know that there was already half a boiled egg at the bottom of my soup. This meal had the kind of volume and variety that had me going for hours (almost literally) - I really liked the combination of tender-cooked and fresh raw vegetables, the flavour of the clear broth and had no hope of getting through the side of rice. The drinks we ordered - a Thai iced coffee for Michael (530円 ~ AU$5.50) and an iced chai for me (510円 ~AU$5.40) - were similarly huge and very sweet, so we ended up saving them for dessert. This was a really fun experience, albeit one that vegans would probably struggle to navigate. In fact, we left wondering if the stock base might've been chicken too. We had no such doubts at Itosho, a vegetarian restaurant that's been running for more than forty years under the helm of chef Hiroharu Ito. Like Bon, which served the most expensive and memorable meal of our last Tokyo trip, Itosho upholds the tradition of shojin ryori, i.e. Buddhist temple cuisine. 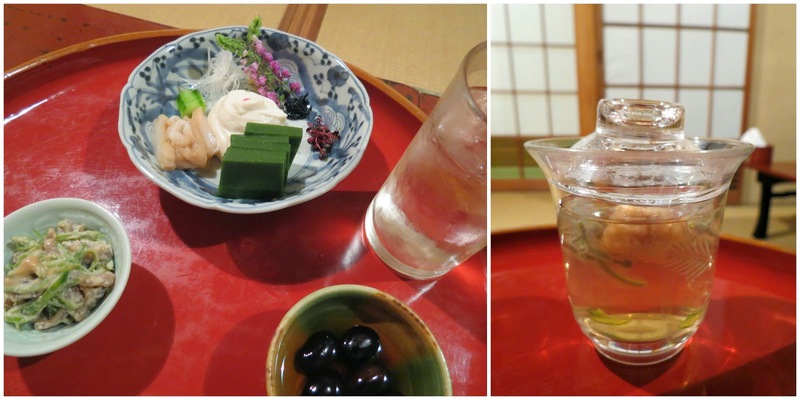 For 8400円 ~ AU$87.80 each, Michael's family all joined us for a multi-course meal at this Michelin-starred restaurant. The restaurant's capacity is small and Chef Ito presented almost all the dishes to us personally, describing them in Japanese to Michael's more fluent siblings. Our first bowl was arranged with walnut-studded silken tofu, gluten, ginger, mushrooms, matcha jelly and tiny purple flowers - I was reluctant to mix it all together as instructed, but the delicate flavours and textures stayed intact. The sesame sauced side vegetables and surprisingly sweet black beans were also fun to pick at. The clear cup of renkon/lotus root soup didn't charm everyone in our group but I liked it well enough, particularly the single chestnut dumpling that bobbed on the surface. Ito's take on tempura was a resounding success by contrast - a tofu slice, shitake mushroom, cornlette, pumpkin piece, eggplant piece and pepper were each coated in crunchy mochi flour pebbles and served with seasoned salt for sprinkling. 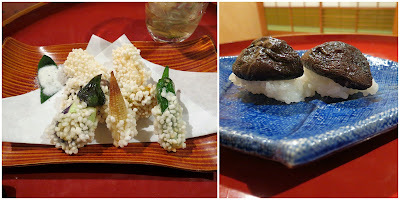 Shitake reappeared in the following course as the subject of simple but excellent sushi. Larger blue plates laid out samples of tiny lacquered potato spheres on toothpicks, tender marinated lotus root and gluten pieces in a green plum sauce. It took this second serve of gluten for me to really appreciate how light and almost gelatinous it was compared to the dense seitans we're accustomed to. I recalled that we'd been served something similar at Kajitsu a couple of weeks earlier. 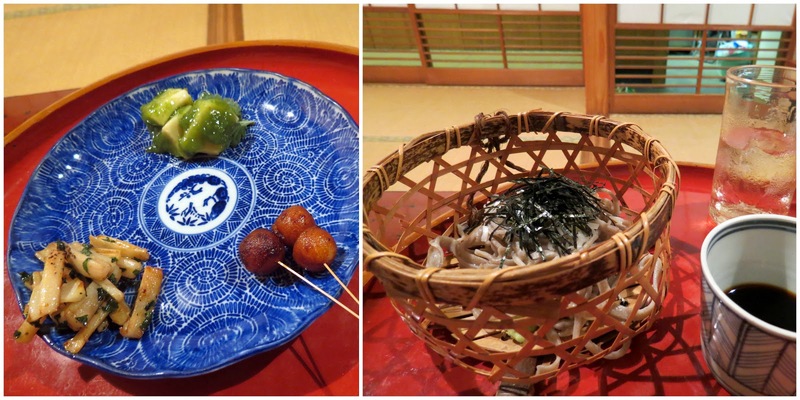 Open-weave baskets held handmade soba noodles with shredded nori and a little wasabi. We dipped them into the cup of soy sauce, marvelling at their fresh texture. 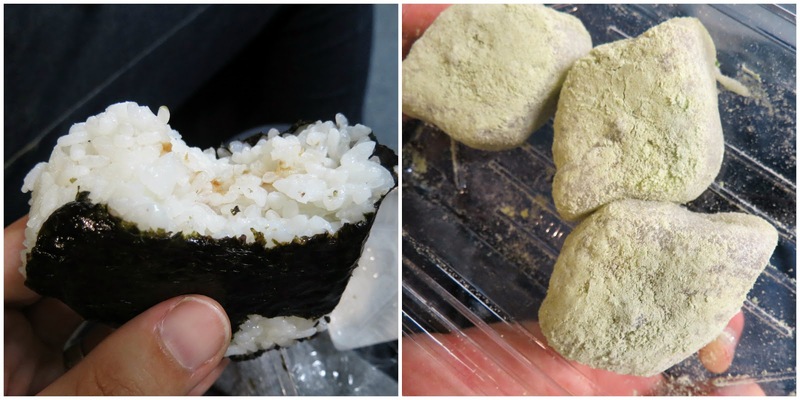 We were feeling a little overwhelmed by the time the tofu-and-burdock imitation fish sushi arrived - their brilliance was almost wasted on us bloated customers. The cloudy mushroom soup was also very, very good - I imagined what a wonderful lunch this single course could make. Relief was at hand, with a melon wedge each served for dessert. It was a soothing finish to a marathon of a meal. It was an evening that filled me with gratitude (as well as vegetables!) - what a privilege to be served by such an accomplished chef, to get a glimpse of an ancient vegetarian tradition, and to share it with Michael's receptive but not-at-all-vegetarian family. We were left to our own devices on Wednesday, with a recommendation from Matt that we flee the heat by catching the train up the hill to the Hakone Open Air Museum. It was surprisingly great - beautiful views, tranquil parkland, a natural hot spring foot-bath and dozens of brilliant outdoor sculptures to explore. The slideshow below captures the highlights - I really recommend making the trip up if you've got some spare time, especially if the Tokyo heat is getting to you. The food options up the mountain were pretty limited - we loaded up on chips and mochi at the supermarket and snacked our way through the trip up, before pouncing on some inari on the way down. 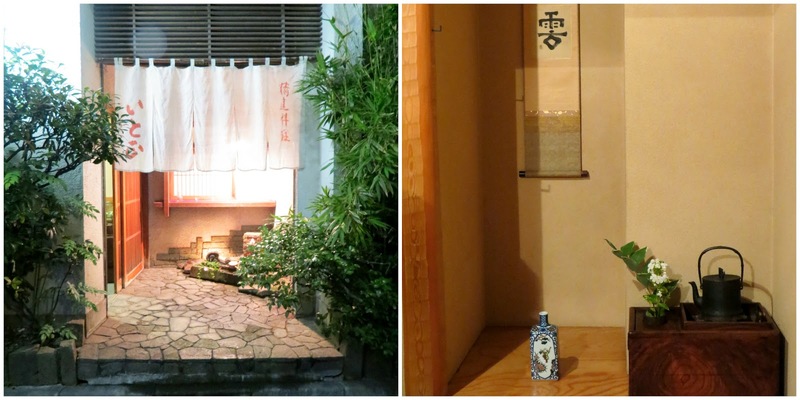 We were lured in to the little snack shop by the plastic model of inari on the table outside and were thrilled when the owner whipped up a freshly made box for us to take away. Brilliant. 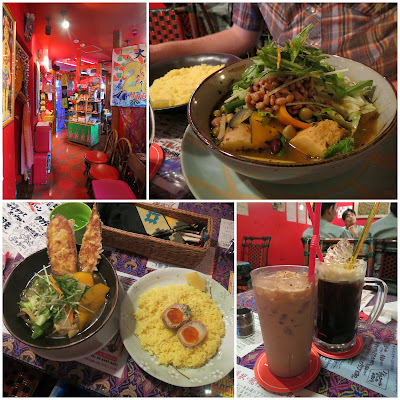 Our aim on our return to Tokyo proper was a visit to the vegetarian ramen place T's Tan Tan (one of the recommendations on this wonderfully helpful post on The Unbearable Lightness of Being Hungry). It's buried deep in the sprawling Tokyo train station and we spent a good half an hour wandering about struggling to spot it. We actually had pretty decent directions, but it took a few stops at the train station maps for us to eventually pin it down. 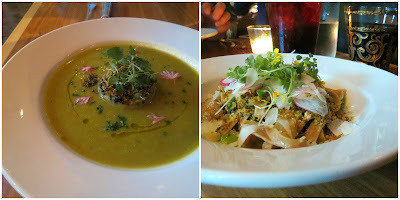 It was well worth the effort - a fully vegan menu focussing heavily on ramen and ramen-related delights. I took the set menu option - your choice of ramen plus a small side bowl for between 1050円 and 1200円 (AU$11 - AU$12.60; pictured top left). I picked the shirunashi tantan for my noodle soup - it came with bean sprouts, pot-herb mustard, chilli oil, black vinegar, cashew nuts, peanuts, sesame oil and soy bean meat and was based around a complex and tasty broth (rather than the watery version that vego noodle soups can sometimes rely on). My small bowl accompaniment was the rich and creamy massaman curry, which had a few scattered veggies among the thick sauce and rice. I cooled myself down with an iced coffee, which was sweet and cold but otherwise not that memorable. 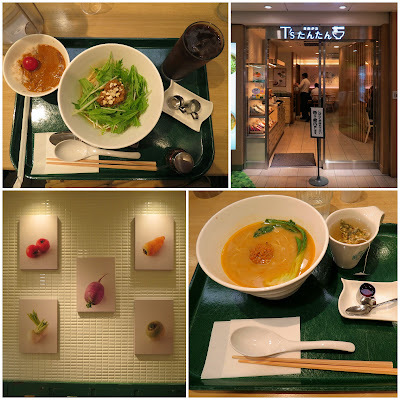 Cindy went for a smaller meal - the original T's Tan Tan ramen (sesame, peanut, soybean meat and green pak choi in a noodle soup, 800円 ~ $8.40; pictured bottom right) and an accompanying cup of sweet apple lemonade tea (450円 ~ $4.70). She was just as impressed as I was. T's Tan Tan is definitely one to add to your Tokyo checklist - it's got a bit of a food court vibe about it, but the food is cheap, delicious and lacking any fish-related concerns. Ramen is such a Japanese classic and one that is challenging to track down in a properly vegetarian form, so we were thrilled to eat so well here. Tokyo has a beverage machine tucked around every corner and Michael happily made use of them, often hunting down a self-heating can of coffee first thing out the door. 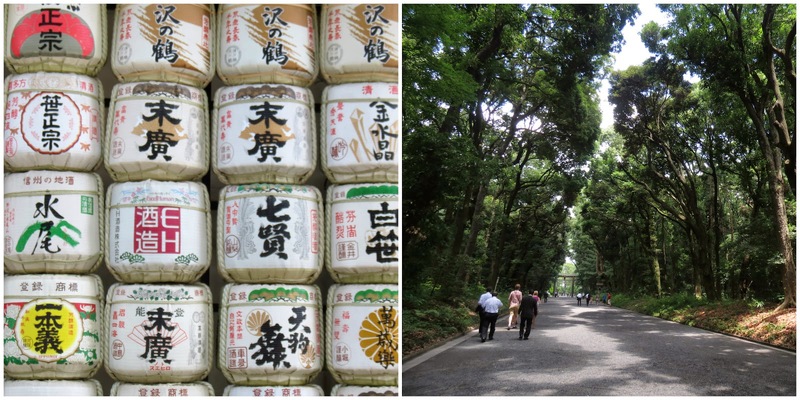 We spent much of our second day with Michael's family, first strolling through Meiji Jingu. 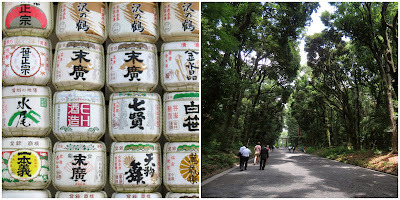 Michael and I had been there before, and in spite of our many fellow sightseers it was a pleasant, relaxing place to be - cooler in the shade of the trees and surrounded by positive prayer cards at the Shrine. Even so, we were thirsty and aching for a seat within a couple of hours. Matt led us to Sakura-Tei for lunch, where we were seated around a hotplate to cook our own meals. We chugged down iced drinks to stave off the plate's radiant heat and ordered a bowl of okonomiyaki ingredients each. Matt helpfully ascertained with our waiter that there was one genuinely vegetarian option among them (1150円 ~ AU$12.10; there was something fishy going on last time we tried this) so we set to work gently folding together cabbage, onion, cheese and eggs into a nobbly batter and arranging it on the plate. I proudly pulled off a neat flip, though I made more of a mess of my fried egg and cheese topping. My 'yaki might've been a little overcooked but there was no faulting it once the brown sauce and mayonnaise were slathered on. We sought out another uniquely Japanese experience for dinner that evening, gathering at an izakaya in Shinjuku, ordering our snacks and drinks directly from an ipad at the table. Honestly, the food at this one wasn't great so I won't bother naming the venue - the edamame were unruly and starchy, the avocado was brown, and Michael and I found ourselves pushing fish flakes off several dishes that had looked vego on the menu. (On the upside, I had a lovely yuzu-flavoured soft drink.) 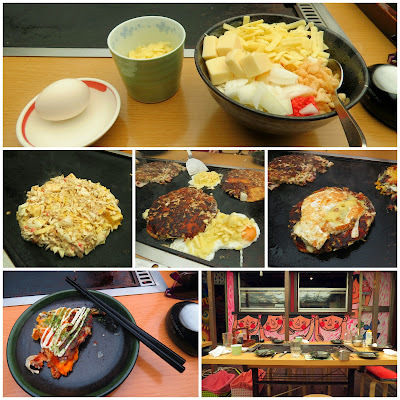 There are numerous other excellent izakaya around Tokyo, and it's well worth giving them a go. We finished the evening timidly exploring Shinjuku Golden Gai, a cluster of tiny bars that usually only welcome friends-of-friends. Even without an in, we could feel the quiet intimacy of this neighbourhood in stark contrast to the huge intersections and looming cinema-screen adverts only a few minutes' walk away. 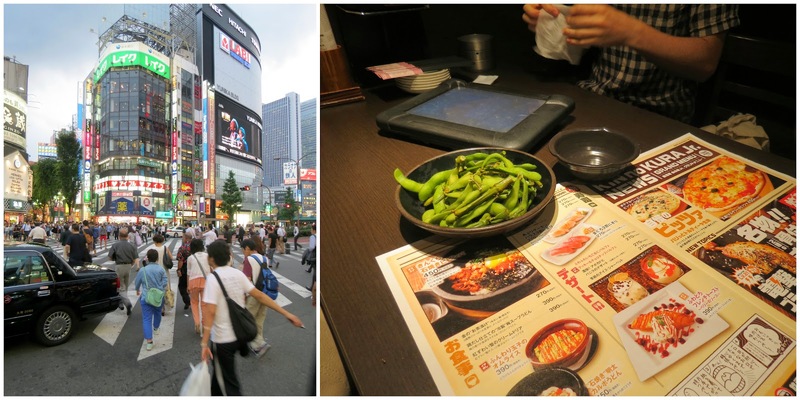 We hit our first full day in Tokyo without having really done much in the way of planning. Luckily, Matt was on the case and had our day pretty well mapped out. We started with a wander around Nakemuguro, browsing through a few shops and wending our way towards Potager Marche, a vegetable focused deli. They sell fruit and veggies, pre-made veggie meals and snacks and have a lunch set for people who want to eat in. 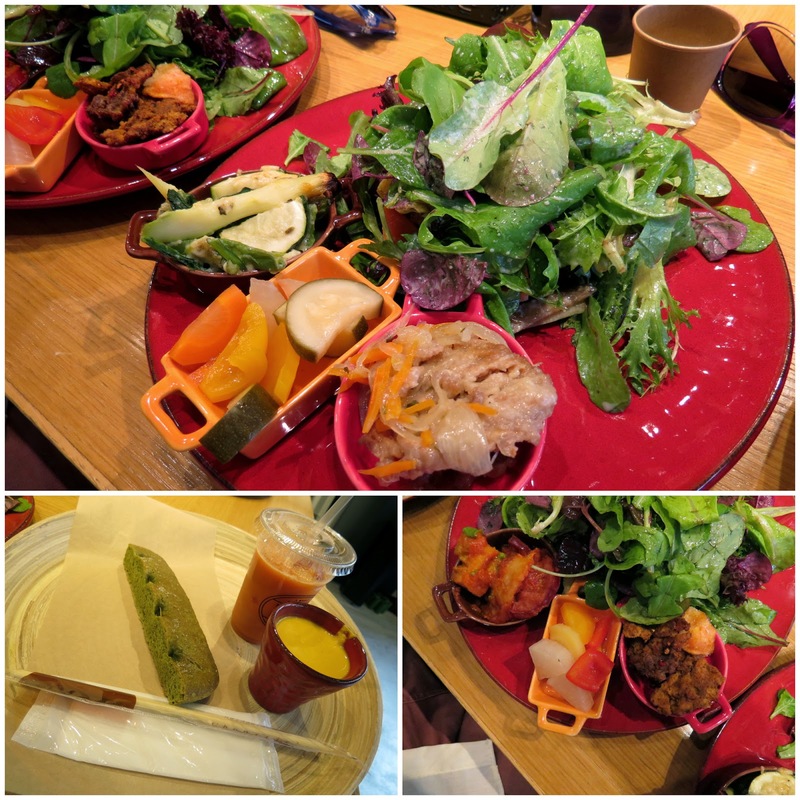 The lunch set is 1290円 (AU$13.50) and involves a little cup of soup, a bread stick, fresh leafy salad, your choice of three sides and a freshly squeezed veggie juice. The sides were the most interesting - there were pickled veggies, a couple of different kinds of mock meat, a gratin and so on. Everything was fresh and tasty - it felt like a good healthy start to our Tokyo eating. 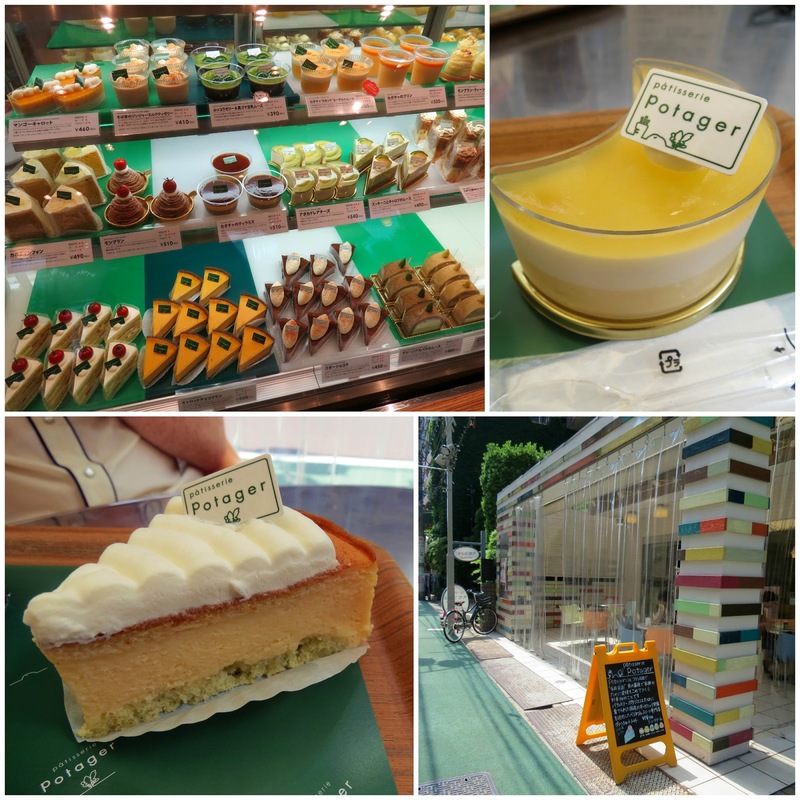 We followed up with a visit to their nearby sister establishment, Patisserie Potager, a sweets shop with an intriguing focus on vegetables - everything has a vegetable component, so there's pumpkin and corn-based treats, radish jelly and a whole range of other odd-sounding desserts. I had a white asparagus souffle (470 円 ~ $4.90), while Cindy went for the passionfruit and yellow capsicum jelly with yoghurt mousse (470 円 ~ $4.90). Both were excellent, although the capsicum in Cindy's got a bit lost under the other flavours while my souffle had distinct hints of asparagus that worked surprisingly well in a sweet context. It's a fun shop and one that would reward more exploration. Vegans might struggle though, my sense was that everything was heavy on the dairy. We strolled around for a while, making our way up the Hikarie building for a view over Shibuya and surrounds and some impressive design exhibitions before trekking back out to track down a source of decent coffee. 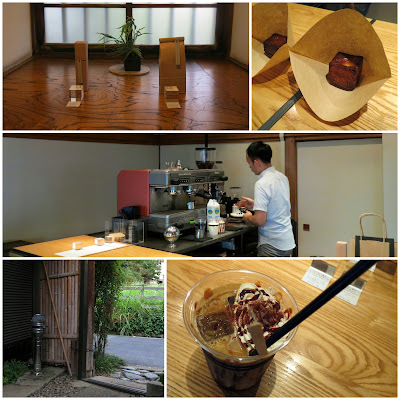 Matt knew just the place - Omotesando Koffee, tucked away in the back streets and offering a tiny peaceful oasis in the midst of the city's buzz. 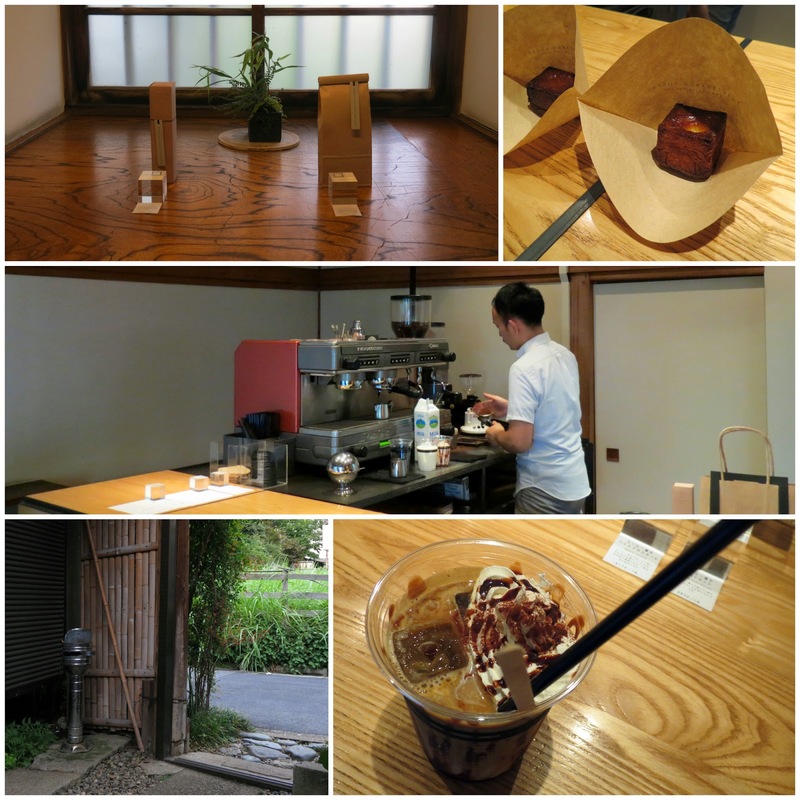 The heat was hitting us pretty hard after our walking, so we all ordered variations on iced coffee: iced latte for me (530円 ~ $5.60), iced mocha for Cindy (660円 ~ $6.90) and an iced cappucino doppio (660円 ~ $6.90) for Matt. We were all sucked in by the amazing baked custard cubes as well (170円 ~ $1.80). 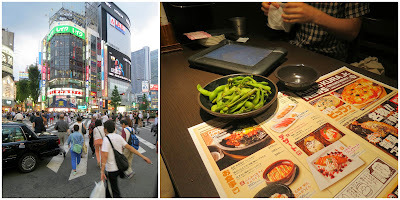 The plan for dinner was to meet up with the rest of my family in Shinjuku where they were staying, but delays in their transport from the airport meant we had time for dinner first. Like a magician, Matt remembered the existence of Ain Soph Journey, an all vegan restaurant, just as we were about to walk past. This was another Japanese veg*n place that was stuck on Western food - Ain Soph offered risotto, tortillas, paella and other slightly uninspiring menu items. I naively expected that most places would be doing vegetarian versions of Japanese dishes, but that didn't seem to be the case. 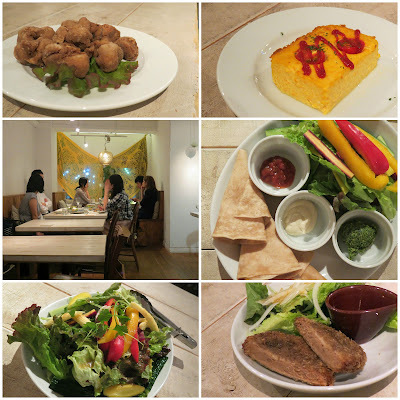 We ordered a mix of dishes to share between the three of us: tofu Spanish omelet (800円 ~ $8.40), tortilla with dips (1200円 ~ $12.60), deep fried veggie meat (650円 ~ $6.80), salad of the day (1500円 ~ $15.80) and a veggie cutlet (650円 ~ $6.80). 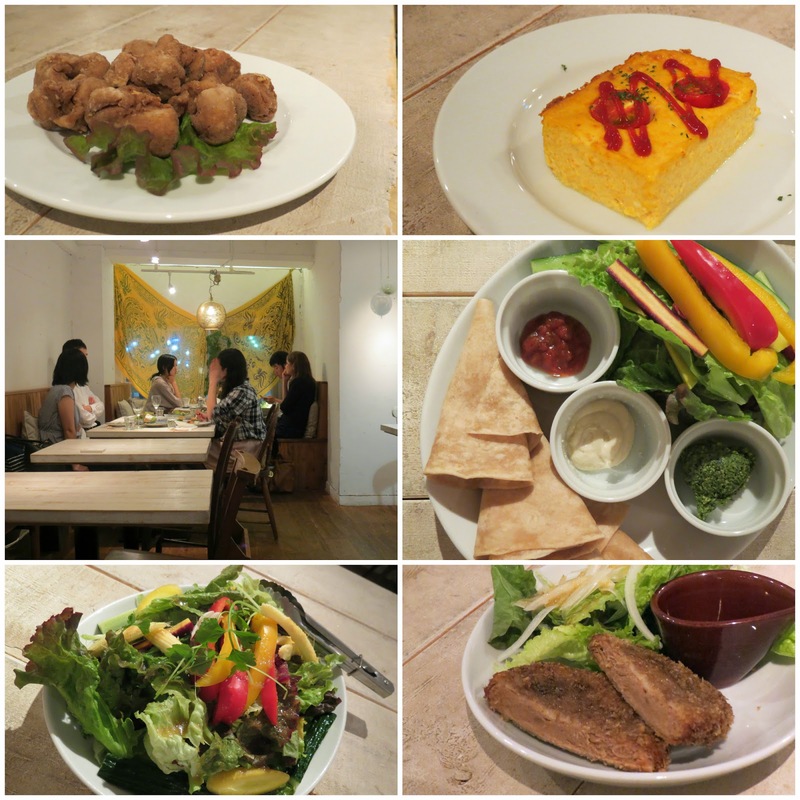 The two fried mock-meat dishes were the highlights, with the salad and dips passable but overpriced and the omelet a bit lacking in flavour. It's lovely (and rare) to be able to order freely in Japan, so Ain Soph's fully vegan menu is going to be a life saver for some, but the food itself probably won't blow anyone's mind. After a quick catch up with the rest of the family at their hotel in Shinjuku, we collapsed back at Matt's house and recharged our batteries for day 2, wiped out from too much food and too much heat. Our final holiday week was spent in Tokyo. It's been four years since our last visit, and Michael's brother Matt stills lives happily in the city. He met us at his local subway stop on Sunday evening and helpfully deposited us at Meu Nota for dinner while he headed off to a gig. The staff at Meu Nota don't speak much English, but they do have a subtitled copy of their menu to share. In any case, every thing is vegetarian so we knew we couldn't go too wrong. It's not a deeply traditional set of options, with falafel bites and couscous salad available beside the miso soup and rice bowl of the day. Michael shoveled his way through the Meu Nota 30 ingredient taco rice bowl (1000円 ~ AU$10.50), a salad with corn chips and spiced bean 'mince' - we think this is where most of the 30 ingredients were going. I dug into a modest bowl of sauteed vegetables in a coconut, carrot and ginger sauce, served over brown rice (850円 ~ AU$8.90). It was comforting home-style food, exactly what our exhausted diner-weary bodies needed. We could barely string together any English let alone Japanese, but I hope we adequately conveyed our gratitude to the friendly Meu Nota staff. 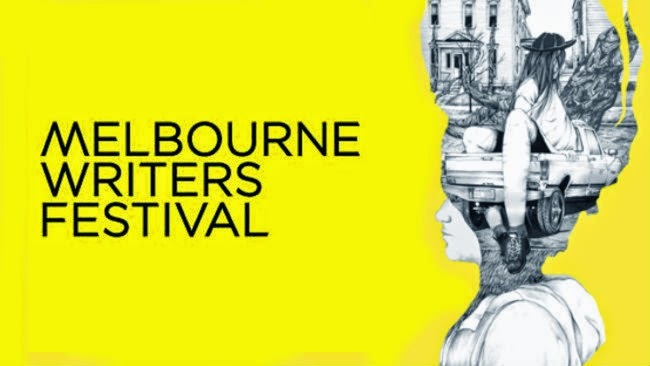 The 2014 Melbourne Writers Festival program was released yesterday, including an extensive selection of Food, Wine and Travel events. I'll be appearing on a panel entitled Thinking & Drinking: Australian Fine Dining alongside Andrea Frost, Ronnie Scott and Estelle Tang. This panel will be held at the Duke of Wellington (an accessible venue!) from 6:30pm on Monday August 25. I'd love to see some friendly faces there - please come and say hi if you attend! The state of Oregon is renowned for its natural beauty and we were keen to get out and see it. The best we could manage given our circumstances and the weather was a half-day tour along the Columbia River, where we were rewarded with a couple of gorgeous waterfalls, lots of thick greenery, and a couple of bird sightings (see slideshow above). Our guide Josh recommended eating at the Goose Hollow Inn and kindly dropped us off there for a late lunch. They're famous for their Rueben sandwiches, and even have a vegetarian Rachel alternative (US$8.85 ~ AU$9.45). Mushrooms, onion, tomato, sauerkraut, Rueben sauce and melted Swiss cheese completely over-ran the rye bread slices in a sloppy savoury avalanche. (It's a very different experience to the Rachel we once made at home.) I enjoyed it very much, though I struggled to get through the pickle, potato salad and carrot sticks on the side. We did a little last wandering in the afternoon and began our evening at Ground Kontrol, a bar and classic games arcade where Michael had his pick of Street Fighter, Ninja Turtles and Terminator 2 pinball. I didn't have any personal nostalgia for these games, but I dabbled in a little Ms. Pacman and enjoyed the subtitled anime film projecting near the bar. They had a great menu of snacks like hot dogs and frito pie with a vegan option for 90% of their items. Portland is really just too cool. We held off on the game-time snacks since we had a dinner reservation at Departure. This bar serves modern Asian food with rooftop views in a setting we weren't quite hip to, sleek and white with interminable chill grooves and very young, entirely professional staff. We observed in awe a table of improbably young and slender girls with fake tans and volumes of meticulously curled hair as they took selfies for an hour (and sat silently with their cocktails communing with their phones for a second hour). This didn't detract too much from the fine food. 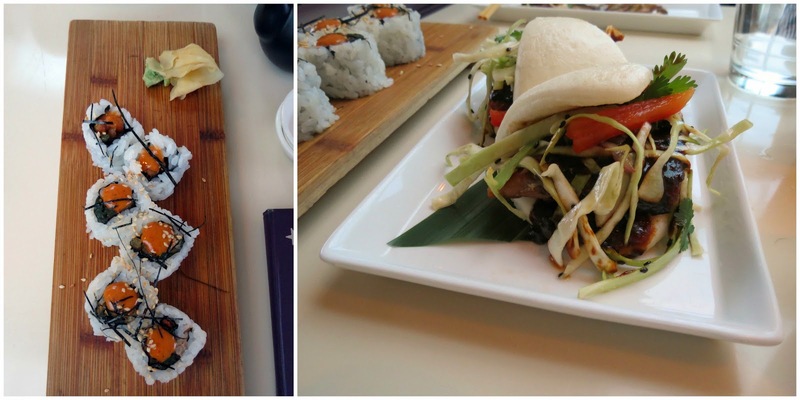 Departure has separate vegan and gluten-free menus that each run to more than a dozen sharable plates. 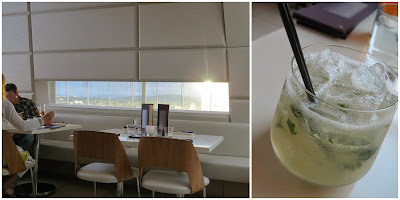 While we took stock of our options, I sipped a Green Hornet cocktail (US$10 ~ AU$10.70), a light sparkling mix with white rum, yuzu, coriander and a lime wedge. After ordering, our dishes arrived quickly in no particular order. 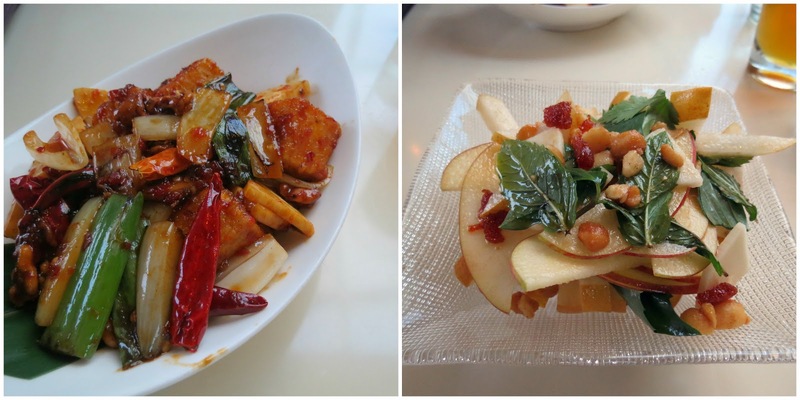 The chili tofu (US$12 ~ AU$12.80) had a great sweet-and-spicy braise, and had been stir-fried with hearts of palm, green onions, whole dried chillis and some candied walnuts that I made sure to clear from the bottom of the bowl. The Asian pear and apple salad (US$9 ~ AU$9.60) included more hearts of palm among the thin fruit slices plus candied tamarind, roasted macadamias and whole mint leaves. The gingered mushrooms (US$13 ~ AU$13.90) were Michael's favourite, delicately layered over sweet and sour rhubarb with fresh watercress and ramps. A dab of spicy miso really made the sweet potato tempura sushi rolls (US$8 ~ AU$8.60) - Michael claimed the wasabi while I swooped on the accompanying pickled ginger. The steamed buns (US$7 ~ AU$7.50) could barely wrap themselves around their char-flavoured tempeh slabs, and we ate most of the accompanying 'slaw and fresh herbs with our fingers. The dessert menu was impressive and we couldn't agree on a dish to share. (We should've, because the portions were large and our available stomach space was small.) 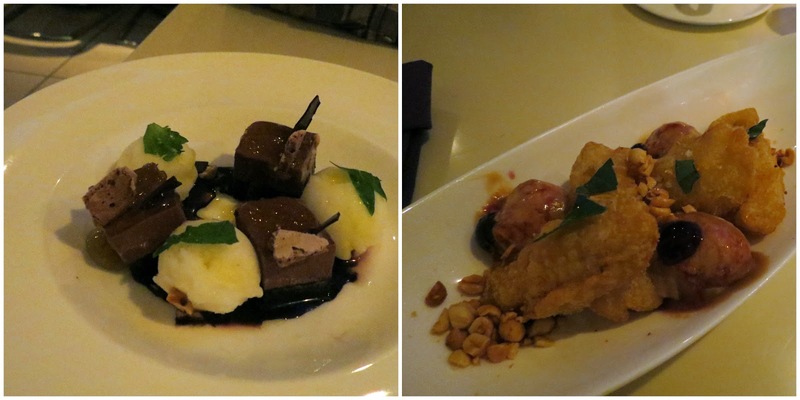 Michael championed the (non-vegan) dark chocolate wasabi bar with yuzu sorbet, yuzu jam and candied peanuts (pictured left, US$9 ~ AU$9.60), while I had to try the vegan Departure banana split (pictured right, US$9 ~ AU$9.60). It involved three enormous tempura banana fritters, miso butterscotch, a dark cherry compote, and a coconut-based peanut brittle icecream. I had to leave the last fritter, but you better believe I ate that icecream. As we walked back to our Portland accommodation one last time, we were drawn to a crowd gathered on a street corner. They'd congregated around a busking band, with a joyous, athletic horn section that got much of the crowd dancing. It was the kind of spontaneous, welcoming street scene that I'll remember Portland for, maybe even longer than their magnificent veg*n food. Thursday started with another trip to the south east suburbs for breakfast at Paradox Cafe and a trawl through the op-shops of SE Hathorne. Paradox is a large diner-style place with a low-key style and laid-back (i.e. friendly but slow) service. 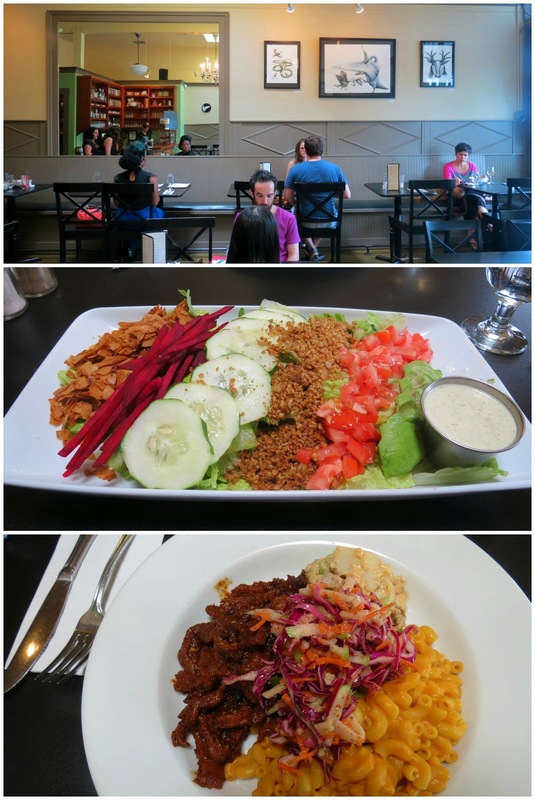 The menu reminded me a lot of Junior's Cafe - classic US diner food done mostly vegetarian or vegan (there's meat on the menu, but nearly everything has a tempeh/tofu version). We split two dishes: the HOG pile - grilled tofu, mushrooms and onions scrambled with spinach, served over herb and onion bread and all swimming in gravy (US$8.50 ~ AU$9.10) and the sweet corn and green chilli potato cakes were covered in roasted corn and fresh avocado, adding some colour to the grilled tempeh (US$8.50 ~ AU$9.10). It was a ludicrous amount of food again, but we managed to work our way through it all - the herb bread and gravy combo was particularly winning (if completely unhealthy). 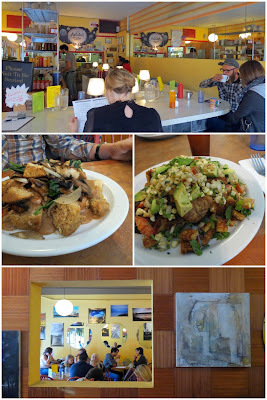 Stuffed with food, we explored SE Hawthorne for a couple of hours, browsing the op-shops, book shops and gift shops and weighing up luggage space vs the excitement of holiday spending. 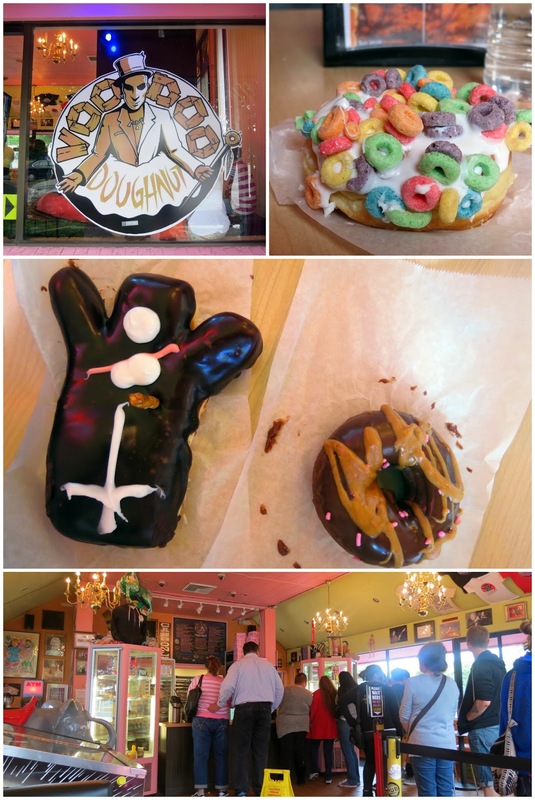 Eventually we worked up enough hunger to justify our trip to one of Portland's oddest must-do tourist experiences: Voodoo Doughnuts. We took Erik's advice and went to their second store (NE Davis) to avoid the massive queues of the downtown branch - the queue was definitely shorter, but the store was still rammed with people the whole time we were there. Voodoo has somehow become a phenomenon - the stores are open 24 hours a day and are constantly busy, with streams of people gorging themselves or loading up boxes of doughnuts to take home as souvenirs (we spotted a few of their striking pink boxes at the airport as we flew out). They made their name selling crazy concoctions - doughnuts glazed with NyQuil or flavoured with Pepto-Bismol and dotted with Tums. The FDA eventually put a stop to the pharmaceutical doughnuts, but the store was already famous and they've continued to thrive by offering a baffling array of doughnuts to choose from - there's toppings like cap'n crunch, bacon, and Oreos as well as more conventional options, loads of vegan doughnuts and their signature voodoo doll doughnut, a chocolate coated little guy with a pretzel for stabbing and a torso full of gooey raspberry jam. We ordered a froot loop doughnut and a vegan pumpkin doughnut with chocolate frosting to really embrace the experience. It was fun, but I'm not sure I really understand the allure beyond the novelty value. After a sugar-induced afternoon breakdown we headed north again to check out Last Thursday, a once-a-month street party that shuts down 15 blocks of NE Alberta (home to Back to Eden and Salt and Straw). The plan was twofold: start the evening at the much-vaunted vegan pub The Bye and Bye and then wander the streets and check out the party. Heartbreakingly though, The Bye and Bye had picked Thursday night to close for 'maintenance', leaving me cranky and hungry and without a real plan. After a bit of aimless wandering and a few near-misses at food carts (the range of mac and cheeses at The Cheese Cart nearly lured us in), I remembered reading some glowing reviews of The Bollywood Theater and we went to check it out. With crowds of people in the neighbourhood for Last Thursday there was, unsurprisingly, a line of people streaming out the door. We joined it pessimistically, only to marvel at how quickly the restaurant was managing to shuffle people in, take their orders, get them seated and load them up with food. We were eating within half an hour I'd guess. And we were eating well! The focus of the menu is Indian street food, so there's lots of little snacky dishes to choose from. 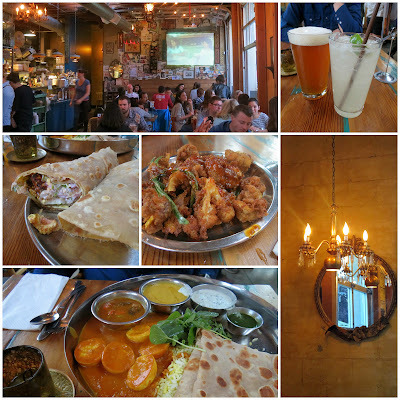 Cindy went with two small dishes - the incredible gobi manchurian (fried cauliflower florets with lemon, curry leaves and a sweet/sour/spicy sauce, US$6.50 ~ AU$7) and a paneer kati roll (paneer, pickled onion and chutney rolled in paratha, US$6.50 ~ AU$9.10). She's still dreaming about that bread. I couldn't resist a big plate and ordered the egg masala thali - boiled eggs in a spicy tomato and yoghurt curry, with saffron rice, sambar, dal, raita, green chutney and paratha (US$12 ~ AU$12.90). It was a ludicrously sized feast of amazing flavours. Our meals had us wishing we could sample more of the menu (the spicy potato dumpling burger and the samosas both called out to me), but we couldn't do it. We didn't eat very vegan friendly meals here and the menu doesn't provide any clear labelling, but the internet assures me that there's a special vegan menu at the counter and that the options are plentiful and tasty. After wandering through the street party some more - break dancing, dodgy stalls, some cute little art galleries - we found our way to dessert via another trip to Back to Eden Bakery. We had to try their vegan soft-serve icecream, and US$6.50 (~AU$7) scored us a Sauvie Island (soft serve, almonds, coconut flakes and berry sauce). It did not disappoint. The ice cream is apparently soy based (made by these guys) but it didn't have that off-putting tofu after taste. Not quite as impressive as the fancy flavours at Salt and Straw but a brilliant vegan alternative, enhanced by excellent toppings. Fully sated and with darkness approaching we made our way back to the bus stop for home. 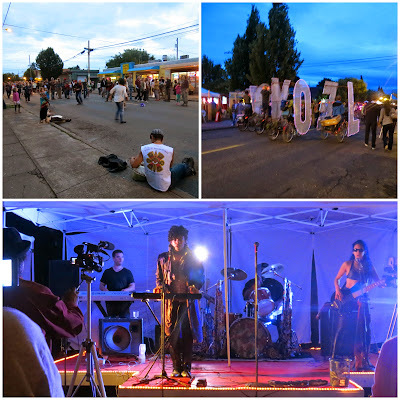 The street party ends very abruptly at 9:30 when the street is reopened to traffic, but the Prince tribute act kicking out the jams in the foodcart pod kept us rocking until it was time to depart. We returned to the north east on Wednesday, starting out with breakfast at one of K's favourites, Back To Eden Bakery. It wasn't difficult to see why she was so fond of it - its cute vintage look, not to mention the entirely vegan and gluten-free goods, was just K's style. And their food was excellent on anyone's terms. 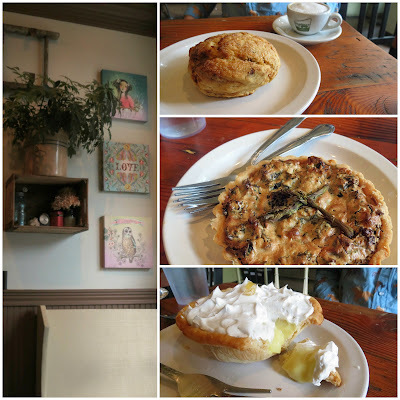 We shared a smoked tempeh, mozzarella and fig scone (US$3.50 ~ AU$3.70), an asparagus-kale cashew tart (US$6 ~AU$6.40) and a lemon coconut cream pie (US$6.50 ~ AU$6.90). These wonderful morsels had me hatching plans for my own oven, though I can barely hope to bake as well as the pros at Back To Eden. We wandered North East Alberta for a while, poking our noses into shops and galleries, taking note of other cafes, bars and restaurants we wanted to try later. One of them was Salt & Straw, an icecreamery that came recommended by our walking tour guide Erik. He boasted about their extensive and imaginative flavours, with new limited edition options popping up every season. The staff were enthusiastic about what they were selling - natural, organic and local-as-possible ingredients - and were generous with the free taste tests. I didn't notice any vegan-friendly labelling, but these are folks you could quiz (you'd surely be half a chance with the fruit flavours). Michael ordered a waffle cone of one of their cocktail series specials, rhubarb and saffron in champagne, while I tried a cup of their oddball pear and blue cheese icecream (US$3.95 ~ AU$4.20 each). These were dense, smooth custards with carefully rendered flavours; no wonder we saw queues out the door every subsequent stroll past the shop. And stroll we did, for a while longer, before getting on a bus back toward our accommodation. We made a stop along the way at Blossoming Lotus for a late lunch. This was not the hippy-dippy Asian-fusion cafe I was expecting from that name. Instead we experienced refined, understated decor and a menu of thoughtfully composed salads, bowls, sandwiches and tacos, all vegan. Michael ordered the Whiskey Ginger BBQ Sandwich and was somehow served up the BBQ Bowl (US$12 ~ AU$12.80). He didn't demur; it held tasty helpings of whiskey ginger bbq soycurls, potato salad, mac and cheese, and green apple slaw. I imagined the Cobb Salad (US$13 ~ AU$13.90) would be a modest choice yet was delivered an enormous platter of food, what seemed like an entire shredded lettuce topped with (left to right) impressively crispy coconut bacon, fresh beetroot strips, sliced cucumber, some underwhelming 'pecan chorizo', surely an entire tomato, half an avocado and a tub of caper ranch dressing. I did my darnedest. We took another easy afternoon (a bit of a Portland pattern) and returned to NE Alberta for a dinner reservation at Natural Selection. As you might imagine, this is a restaurant focused on seasonal plant-based ingredients and they tend towards European styles of preparation. It's cosy yet upbeat, and not too formal. The kitchen offers two alternative dishes across each of four courses, at least one of which is vegan and gluten-free; with two of us at the table we were able to sample all eight plates (at US$45 ~ AU$48pp). They started us off with a small but complex amuse bouche of beetroot and pear cubes and watermelon radish in a vinaigrette, garnished with shallots and beetroot soil. For the first course, there was a velvetty asparagus, leek and potato soup garnished with parsnip, chives and lemon oil. It was just barely outdone by a dish of chestnut pasta with rapini, garlic, chilli, raisins and parmesan - I loved their light hand on the dressing and generous use of fresh greens, proving that pasta can be light and summery. Next, salads. 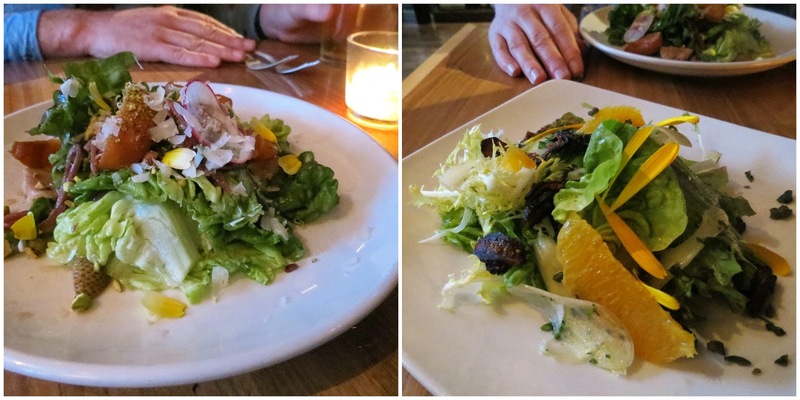 The left plate combined butter lettuce and apricots with pickled strawberries, snap peas and pistachio cream. On the right we had a more astringent mix of lettuces and icicle radish with orange, dried fig, fennel and fried olives. The main dishes were warmer and heftier, though they still had their fine dining flourishes. Michael preferred the wild rice and beetroot (pictured left) with mushrooms, cider, fennel and a thick parsnip puree. 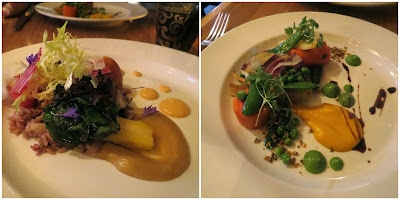 I was more taken by the peas and carrots, though the confit carrots were tough to get a knife through - a bit of mint really lifted the pea puree. A small serve of lemon ginger cinnamon granita perked me up no end. Given how well these ingredients work in pairs, I shouldn't have been so surprised that they were a great trio. 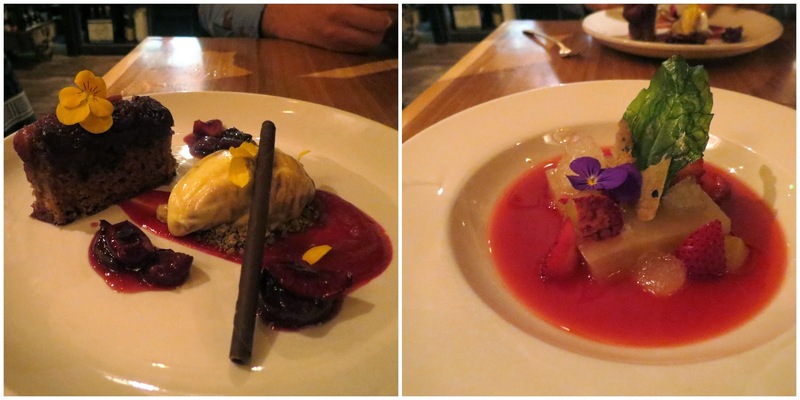 The lychee gelee dessert (pictured right) was always going to be a hard sell for me, but some strawberries set it right. (While I'm not afraid of basil in a dessert, the granita and deep-fried leaf here didn't help me out.) The cherry and cornmeal upside down cake (pictured left) was more predictably our style, served with a stunning orange and balsamic icecream. This was a good meal in a splendid restaurant; I was glad to eat such a variety of fresh produce. Not all of the fancy accents and nth ingredients enhanced my enjoyment but there were a couple of memorable moments - the chestnut pasta, lemon granita and orange icecream among them.